The MNPV8HV-DLTL 4X's red handled is LOCKABLE IN THE OFF POSITION! 4 strings into the combiner with 2 separate 30 amp strings out. Specifically designed for the new dual channel MPPT on the transformer-less inverters. This configuration will break the Positive and Negative of 2 separate 600vdc strings. Description: SMA requested MidNite Solar to design and build these DLTL combiners. There are 4 strings entering the combiner with 2 separate strings out. 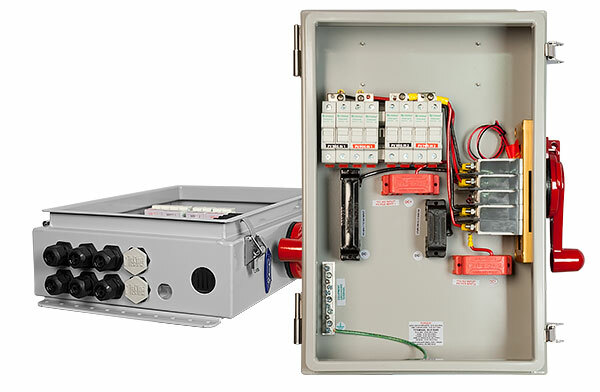 Specifically designed for the new dual channel MPPT on the transformer-less inverters.